The Puritans believed God gave us two sacred texts–the Bible and Nature. All we have to do, they said, was look, really look at the world to see its underlying design. Now, after having been married twice in one day by a Navajo medicine man and an Episcopal priest, I’m inclined to agree. Joe and I chose several Bible passages for our service, including the well known 1 Corinthians, 1-13. I allude to its opening verse, ‘Though I speak with the tongues of men and of angels, but have not love, I am become sounding brass or a clanging cymbal,’ in my subtitle. Saturday, May 14th, dressed in our best duds and wrapped in matching Pendleton blankets, we slide into our car and join the caravan down the Road to Nowhere. Our leader: Philmer Bluehouse, Navajo healer (or medicine man). We pass grazing land surprisingly green and dotted with horses and cattle. In the background, massive red rocks, like a giant’s sculpture garden. The cars bump down a dirt road, making a haze of dust, then stop. Before us: a field stretching between the distant mountains and a wall of red boulders, which shelters a circle of sand. 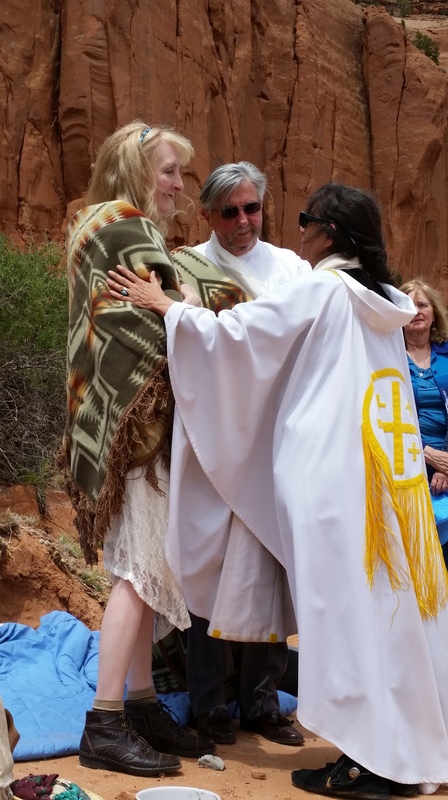 As Phil directs Margaret and Paula to build the fire, and Steve sets up cameras to record the ceremony, Cynthia gathers our friends to distribute the gifts that the wedding party traditionally gives their guests: a Navajo blanket and a horse. Well, no, we didn’t have any horses, but the beautiful blankets prove practical for sitting in a semi-circle around the sacred fire, our temporary home. Phil teaches as he performs the ceremony. He calls us Baby Boy and Baby Girl, because we are just starting out on our journey. As he chants, Joe and I walk east, across the circle, the path of life, to the Universe, where we will receive the medicine—the knowledge of union, affection, protection. Then, singing Arrival at Home, Phil sprinkles corn pollen around the circle, and when we return to our seats, he anoints our brows. Look at that, he exclaims. You’re protected in your journey. There, on the ground, the pollen has settled into the shape of an arrowhead, the white arrowhead of peace. I didn’t do that, Phil adds. It came out of the bag itself. That’s the wonderment of a creative god. He shows us things in a supernatural way, beyond our control. That song, The Union Song, as you were walking—left foot, right foot—the balance of life. Left brain, right brain, your heart, the two chambers. There’s a lot of metaphors. Look around you. See that spire? Slightly apart from our wall of red boulders stands a sandstone spire. He continues, There are two spires going up; two, yet joined. That’s why I chose this place. That’s you. You are the spires of life. Now comes the sacred water. Paula hands me the double spouted wedding vase, one side, the darker side, the masculine, the warrior; the lighter spout, the feminine, the nurturer. I pour water onto Joe’s hands, which he then holds, palms up to the Universe. He does the same for me. Next, the wedding basket, its woven design a semi-circle with an opening facing east. It holds the blue corn mush. We link arms and feed each other. Now the union is there, Phil says. Mother Cynthia stands, holding the Prayer Book. She is a picture in black and white—her black alb, her white cassock, her white chasuble, her intricately knotted stole, and her black curly hair escaping its mermaid braid as the wind picks up. Dearly Beloved… We always have to start with that, she smiles. We make our declarations, our vows. She reads selections we have chosen from the Bible, including the story of the wedding at Cana, where Jesus turned water into wine (John 2. 1-12). You know the story. When the wine ran out, the mother of Jesus said to Him, They have no wine. Though His hour had not yet come, He ordered the servants to fill six stone waterpots with water. Draw some out now, and bear it unto the governor of the feast, He commanded. When the ruler of the feast tasted it, he declared, Every man at the beginning doth set forth good wine and, when men have well drunk, then that which is worse; but thou hast kept the good wine until now. Cynthia looked at us, Chris and Joe, you are the good wine. When Phil asks if anyone wants to give us advice, Cynthia says, I would. We have combined three traditions today—the Navajo, the Christian, and the Buddhist, the teachings that come from the well and foundation of the earth. She walks over to Joe. Joe, I believe you know what this is. She presents him with a khata, a white silk Tibetan scarf. I got this scarf years ago when I heard the Dali Lama speak at Emory. I brought it out here with me to Arizona, but I didn’t know why. And then I realized, it was to give it to you. She drapes it around Joe’s neck. He is overcome. She presents me with a braided belt, woven in white, red, and black, a rainbow pattern, the symbol of a married Navajo woman. Cynthia concludes: You have your robes. You have your scarf, your belt, your rings. You have all these outward symbols. And you have inner symbols, too. You are blessed and to be a blessing to one another, a union—we all are one. Reader, I Married Him. Actually, that’s the title of a new book inspired by the iconic words in the conclusion to Jane Eyre. Edited by Tracy Chevalier, it is a collection of short stories by today’s finest women writers. I took this book with me on our trip and finished it about the same time we got married. Our own story fits right in. And, so, Dear Reader, what about you? Where do you find stories? This entry was posted in Storytelling and tagged 1 Corinthians, Blue corn mush, Episocopal wedding ceremony, Jane Eyre, Navaho medicine man, Navajo wedding ceremony, Navajo wedding vase and basket, Pendleton Indian blankets, Philmer Bluehouse, Reader I Married Him Tracy Chevalier, Tibetan Khata, Wedding at Cana. Bookmark the permalink. Just realizing your question probably meant personal stories, not published fiction. In that case, allow me to amend my answer. What an interesting and wonderful ceremony! Many happy years to you both. 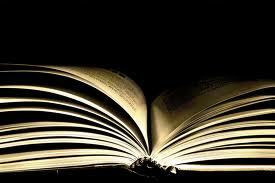 I find my story in the universe, through careful observation and listening and, of course, through my own experiences. It was an interesting ceremony! And speaking of the Universe–where we went “to receive medicine”–more and more I believe careful observation does reveal underlying patterns, just as those Puritans thought. And, as you yourself know, a good writer must be a careful observer. Thanks for the comment, Sue. I meant where do you find stories period. As writer–as you know–finding a story, finding smaller stories to flesh out the bigger story is not always an easy task. I too find stories from friends and family, family in particular. But on this trip, I kept running into the most interesting stories that wove in and out of our travel. I had to leave out so much to keep this blog clamped down to 2 days. 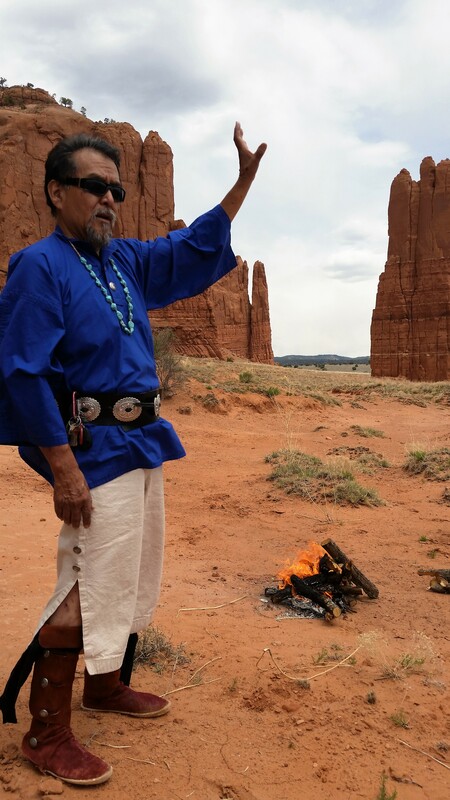 Here’s one tiny example: our native guide at Acoma Pueblo’s Sky City. (Look it up–great 1100 year old story there.) He told us how he earned his nickname, Turtle. I could see using that tidbit somewhere to flesh out a character. stories and making suggestions, so it’s a blend, I guess! Susan, I believe you should take pen in hand (metaphor there) and put down some of those stories (as you do in your wonderful book review coming out next week). You’ve got writer’s genes. Look what you passed on to your son!